How and when did you first start running? I was absolutely hopeless at sport at school and have been ever since. My abiding memory of cross country was finishing last and having to walk to my Grandma’s house to get her to drive me home! A particular lowlight was being forced to enter the “handicap” race at school sports day and my PE teacher having a massive go at me for a sprint finish as I’d not put enough effort in during the race. I ALWAYS sprint finish now!! I really don’t know why I started running but I began at parkrun in September 2013. Still going strong and have tipped over the 100 marker! I am totally chuffed with this. What brought you to Nidd Valley? Like most people. It was Jeff. The guy is a solid gold legend. I wanted to improve as I was running on my own and entering races on my own and I thought NVRR could help me. What I have found at Nidd Valley is the team spirit being rather overwhelming at times, but a good overwhelming! I have so many great friends too that will run with me on a Sunday morning or pick me up on a Thursday night club run when I’m struggling. What is your favourite running music? Genre or specific tracks? I used to run with music but don’t anymore. The escape to the outdoors is soundtrack enough. What is your favourite food before and after running? My pre run routine is a coffee and 3 weetabix if I am at home, or coffee and flapjack otherwise. I’m not a big eater after a race but a post race pint is always a winner for me. What is your best running tip that you would like to share with us? You can absolutely do it. If I can, you can. What is your proudest moment in your running career? 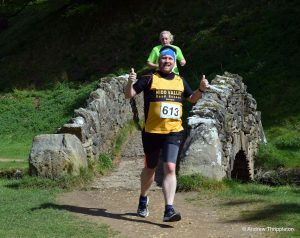 Being part of the Team Nidd photo that was taken at the 2017 Brid Half. To be part of a team as fabulous as we are was a real moment for me. The realisation that I can take part and contribute, from the back. What are your running goals? I would like to consistently run under 30 minutes for a 5k and I have aspirations of a sub 60 minute 10k. Even 59:59 would do me. I also want a Gold medal at the club dinner. What event are you training for at the moment? The Great North Run.